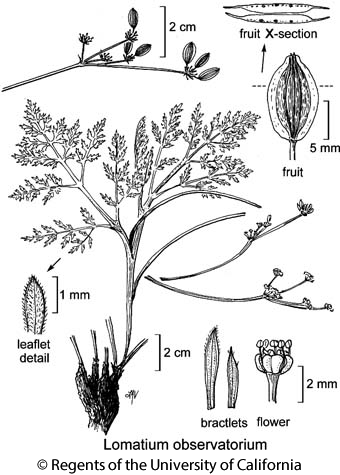 Habit: Plant 1--3 dm, puberulent to short-hairy; taproot to 15 cm. Stem: +- 0. Leaf: petiole 3--6 cm, sheathing throughout; blade 4--12 cm, ternate-pinnate, ultimate segments lance-linear, acute, 1--8 mm, +- 1 mm wide, ciliate. Inflorescence: peduncle 0.8--20 cm, exceeding leaves; bractlets 5--10, 3--4 mm, lanceolate to obovate, narrowly scarious, margins ciliate; rays 1--3(7), 1--8 cm; pedicels 1--5 mm. Flower: ovary, fruit glabrous. Fruit: 7--10 mm, ovate; wings +- 0.6 mm wide. Citation for this treatment: Lincoln Constance & Margriet Wetherwax 2017, Lomatium observatorium, in Jepson Flora Project (eds.) Jepson eFlora, Revision 5, http://ucjeps.berkeley.edu/eflora/eflora_display.php?tid=77416, accessed on April 22, 2019.
se SnFrB (Mount Hamilton Range). Markers link to CCH specimen records. Yellow markers indicate records that may provide evidence for eFlora range revision or may have georeferencing or identification issues. Purple markers indicate specimens collected from a garden, greenhouse, or other non-wild location.